This year Frederick Holmes School secured a bursary to engage professional musicians to work on a project with their students, but they still invited our Year 10 Music GCSE group to visit them in the summer term to see the results of that work and to do some small group work on a new project. As ever, our students were amazed at the massive difference that music can make to students with learning or physical difficulties. Their faces light up when they hear the sounds and are able to join in making music to fit a particular mood or story. 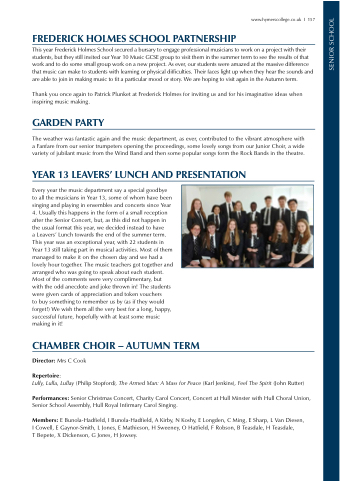 We are hoping to visit again in the Autumn term. Thank you once again to Patrick Plunket at Frederick Holmes for inviting us and for his imaginative ideas when inspiring music making. The weather was fantastic again and the music department, as ever, contributed to the vibrant atmosphere with a Fanfare from our senior trumpeters opening the proceedings, some lovely songs from our Junior Choir, a wide variety of jubilant music from the Wind Band and then some popular songs form the Rock Bands in the theatre. to buy something to remember us by (as if they would forget!) We wish them all the very best for a long, happy, successful future, hopefully with at least some music making in it! Senior School Assembly, Hull Royal Infirmary Carol Singing. T Bepete, X Dickenson, G Jones, H Jowsey.